When I’m in the mood for homemade biscuits but don’t want to do all the work of rolling and cutting, I turn to this simple recipe. 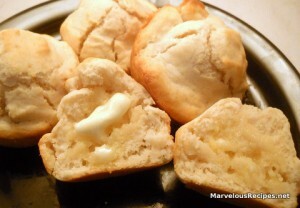 The shape is different because they are baked in a muffin tin but the texture and flavor are pure biscuit heaven! 1. In a small bowl, combine the flour and milk; blend well. Stir in the mayonnaise and blend well. 2. Spoon the dough into well greased muffin tins to about 1/2 full. Bake at 400 degrees F for 15 to 20 minutes or until golden brown. Makes 6 to 9 biscuits depending on the size of the muffin tins.